﻿ Following the deluge﻿ of articles on August 28 and 29, declaring in one form or another the death of gamer culture, a new voice started to speak out. These journalists, who were speaking out for the repressed minorities that were not allowed a place in gaming, suddenly had a new critic. The repressed minorities who were not allowed a place in gaming. #Gamergate had a new ally. #NotYourShield. This was a whole other side speaking up now. The narrative being espoused by journalists shared another common theme. That white males dominated the space and were unwilling to let others in. #NotYourShield was a direct rebuttal to that. It flew in the face of the narrative that gamers were a single homogeneous group. Based on the incidents I have conveyed so far, I pose a question: do you think the reaction of the mainstream gaming journalists was to retract the statements and admit that they had unfairly portrayed a rich and diverse subculture as being homogeneous? Or do they attack these minorities who they claim to be defending and accuse them of that most egregious sin, secretly being white males? I will allow you a moment to weigh your decision. If you selected retracting the statements and admit that they had unfairly portrayed a rich and diverse subculture as being homogeneous, you would be incorrect. What were these journalists saying: Sock puppet accounts. Males pretending to be minorities to garner support for their misogynistic exploits. 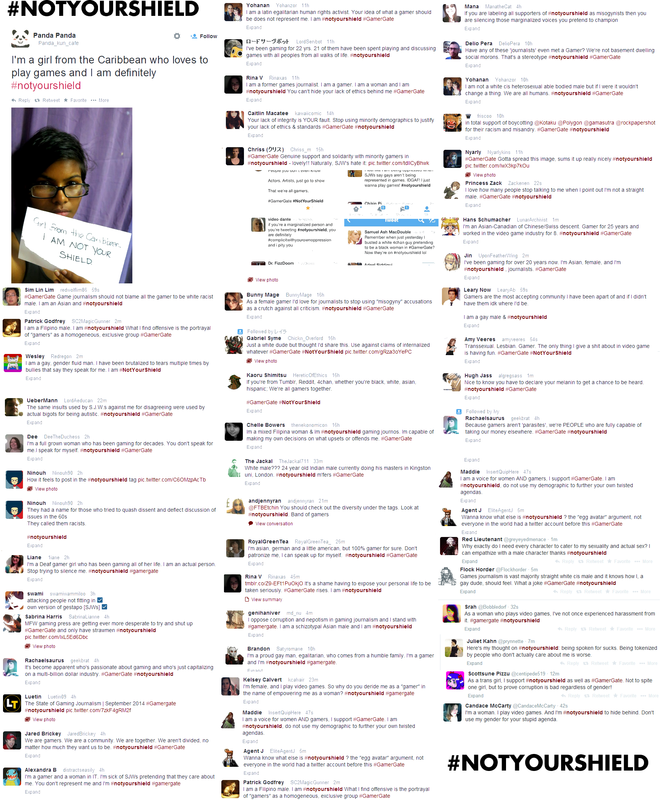 I now pose another question: Did these people using the #NotYourShield tag lay down and accept that they were not capable of being a part of the culture they had been a part of for years, or did they risk their own livelihood and safety to show that they were indeed real people and they were not ok with being used to further the political goals of a small subset of reporters. I shall again allow you a moment to weigh your decision. If you guessed these minorities were pissed off, you are correct!